ARTICLE 2.- The Nationality of the INTERNATIONAL BUDDHIST ETHICS COMMITTEE & BUDDHIST TRIBUNAL ON HUMAN RIGHTS, will be "Transnational", by establishing that its members shall have diversity in terms of nationalities. ARTICLE 3.- The Duration of the INTERNATIONAL BUDDHIST ETHICS COMMITTEE & BUDDHIST TRIBUNAL ON HUMAN RIGHTS will be "Indefinite" or "Perennial" as from the celebration of this Constitutive Act. A) PRESIDENT and SPIRITUAL JUDGE (Vinayadhara): Is that who shall have the faculty to advocate for the appropriate functioning of the Committee and Tribunal, by providing ethical guidance to the Prosecutor and the Public Defender during the stage of procedure, by validating charges, evidences and procedures. In addition, he or she shall have to exert Presidency during the stage of Judgment and Ethical Conclusion in the Case. For this position it is required to be Master of Buddhist Spirituality as well as having formal knowledge in International Law. B) PROSECUTOR: That who shall have the faculties to investigate and prosecute People, Institutions or Countries accused of committing violations against Buddhist Spirituality or Human Rights, by bringing evidences of the case to the Jury Members. For this position it is an imperative requirement not only to have and Academic Training in Law or Human Rights, but also to have Buddhism studies. C) PUBLIC DEFENDER: Who shall have the faculty to defend the accused party in cases in which the latter does not have his or her own lawyer faced of the procedures of the Committee and Tribunal, by being able to impugn charges and evidences submitted by the Prosecutor. For this position it is indispensable requirement not only have an academic training in Law or Human Rights, but also to have Buddhism Studies. D) SECRETARY: Is that who will have the faculty to establish institutional ties with other international courts, such as the International Criminal Court (ICC) and the International Court of Justice (ICJ), sharing them the evidences and judgments of the cases performed by the Buddhist Tribunal on Human Rights. For the position it is an indispensable requirement being a Buddhist and having administrative experience. E) PEACE AMBASSADOR: Is that who will have the faculty to share a message the peace on behalf the Committee and Tribunal around the world. ARTICLE 25.- The present Procedure of the INTERNATIONAL BUDDHIST ETHICS COMMITTEE & BUDDHIST TRIBUNAL ON HUMAN RIGHTS is not regulated by any state authority, being a process of ethical and spiritual nature which continues with the ancient justice system of the Buddhist Law. Nevertheless, the procedure is legal because it relies on the "special jurisdiction" of Tribal Law, but also in the "universal jurisdiction" of International Law. Thus, the Committee and Tribunal have the right to promote, develop and maintain the institutional structures of Buddhist people and their distinctive customs, traditions, procedures and juridical practices, simultaneously adhering to internationally recognized standards such as Declarations, Covenants and International Conventions on Human Rights, especially emphasizing the "169th Convention of the International Labour Organization (ILO) on Indigenous and Tribal Peoples" of 1989, along with the "UN Declaration on the Rights of Indigenous Peoples" of 2007, and the American Declaration on the Rights of Indigenous Peoples of 2016. FIRST STAGE "RECEPTION OF THE CASE"
SECOND STAGE "RECEPTION AND INVESTIGATION OF EVIDENCES"
ARTICLE 42.- The Prosecutor will collect the Evidence on the possible case of violation of Buddhist ethics or Human Rights. These evidences will come both from the Claimant or Offended Party and from the investigations of the INTERNATIONAL BUDDHIST ETHICS COMMITTEE & BUDDHIST TRIBUNAL ON HUMAN RIGHTS. Evidences will be analyzed by the Prosecutor, who will decide if the case merits the Procedure of "Ethical Judgment". ARTICLE 44.- The INTERNATIONAL BUDDHIST ETHICS COMMITTEE & BUDDHIST TRIBUNAL ON HUMAN RIGHTS will provide the opportunity to the Imputed or Requested Party in order that in the term of 5 working days issues a Response of what it considers as a defense or accepts and adheres to the facts alleged against said Party in the Indictment and may justify their actions or present evidence of his innocence. The omission or refusal to issue Response and / or provision of evidence will not be considered as acceptance of the facts, acts or omissions that are imputed, but neither will be stopped the subsequent legal procedures of the Ethical Judgment and Sentence, which will be carried out in the "absence" of accused provided that he/she/it does not make his/her/its statement. It is important that if the defendant intends to question the competence of the Committee and the Tribunal, he or she should state it during the "Response" stage of the accusation, since if he or she does not do so, it will be understood that it has consented to the Ethical Trial. ARTICLE 45.- In case the Required or Accused party offers sincere public apology for what was done, and as far as possible amends his/her/its fault or violation to the Buddhist ethics way or human rights, in such cases the accused shall apologize publicly and formally, simultaneously performing acts designed to amend their offenses. In these cases the Committee and Tribunal agree on a "Peaceful and Reconciliatory Resolution", with no need for the voting of the Jury members and the President's Sentence. However, if there is a repeated infringement, such "Peaceful Conciliatory Agreement" would have been violated, situation in which the voting of Jury members would be immediately held together with the subsequent Ethical Judgment. 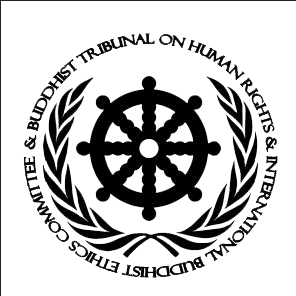 ARTICLE 48.- Faced with Evidences submitted, the Jury Members of the INTERNATIONAL BUDDHIST ETHICS COMMITTEE & BUDDHIST TRIBUNAL ON HUMAN RIGHTS shall issue a Judgment or Verdict as a decisive part of Ethical Judgment, the Accused being declared as "Responsible" or "Innocent" in the Buddhist Ethics and Human Rights arena. The vote of "Abstention" would also be permitted, although after 4 consecutive abstentions it shall be considered effective the resignation of the Jury member. The Jury will issue an Opinion by a simple majority in the term of 5 five working days. The vote of the Jury members is secret. ARTICLE 53.- As an alternative to the votes of "Responsible" or "Innocent" and also of "Abstain", it will be allowed to declare the accused as "Insane" provided that the evidences merit it. ARTICLE 54.- The President may declare the vote of a member of the Jury as "Null". This may occur when the member of the Jury votes with reasons that violate Buddhist Law, Human Rights or Jurisprudence of the Committee and Tribunal.